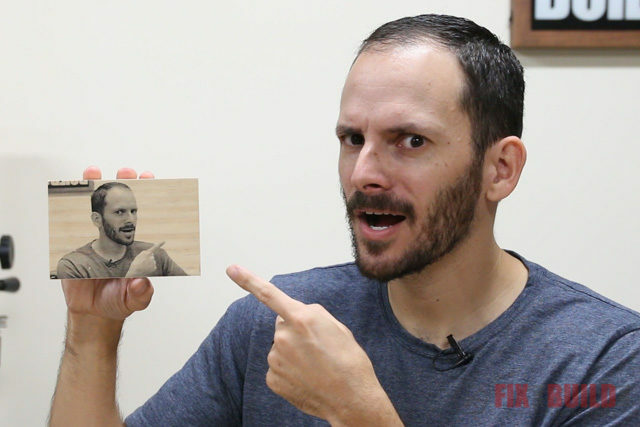 Today I’ll show you 5 ways to print on wood! 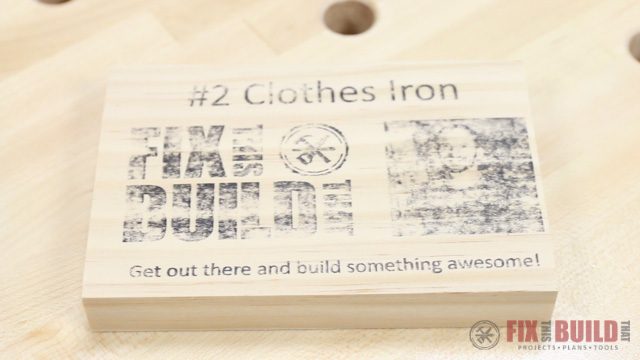 Wood prints are a great way to make customized signs, ornaments, awards or just to brand your work. I tried four DIY image transfer methods and then used a sweet piece of technology for the fifth. I was actually really surprised by the results since that one I love was sitting in my shop and I didn’t even know it! 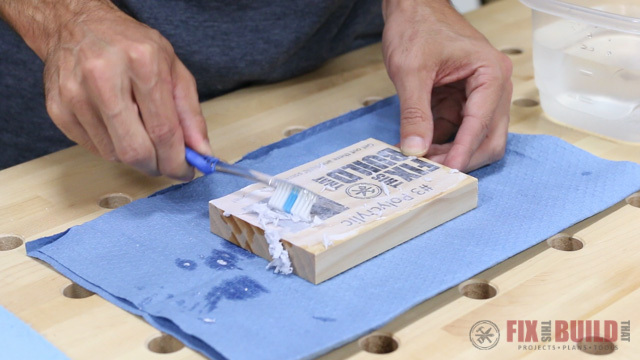 Be sure to watch the video below to see each wood printing method in action! 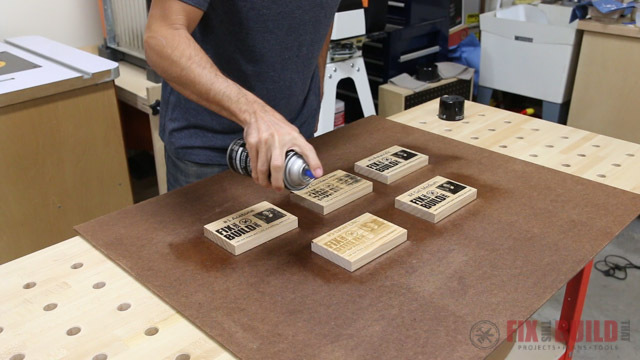 I’ll walk you through each of the 5 ways to print on wood I’ve listed above. 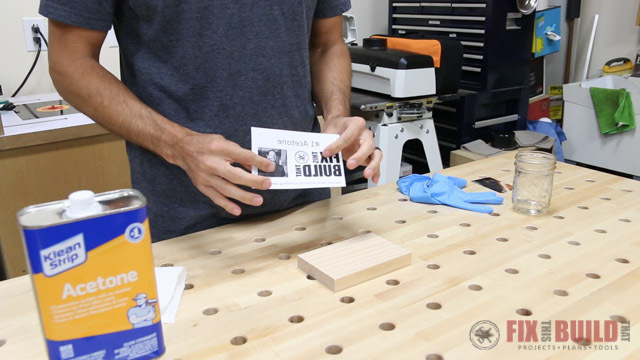 I’ll show you what you need, how to apply it and any clean up needed on the wood prints. 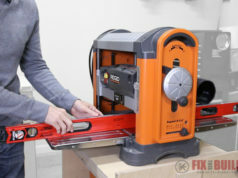 I’ll also give you the pros and the cons of each method and what the wood prints look like after some finish is applied. Here is the artwork I’ll be using to evaluate each wood printing method. All the prints were done on my laser jet printer, not an ink jet. And I mirror imaged the artwork for the ones I actually used to do the wood prints. I’ve included my logo which has large block text, a picture, and some normal sized text. 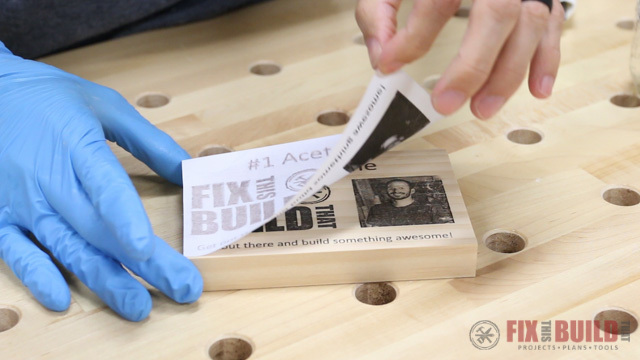 This will do a good job showing how each way to print on wood reacts to different text and image types. Okay, let’s get started with the first one! 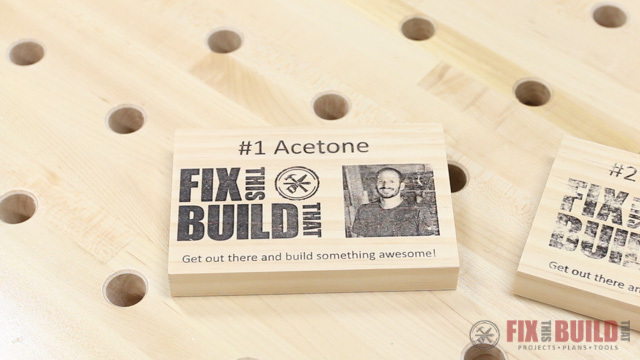 The first way to print on wood is using acetone to transfer the toner to the wood. 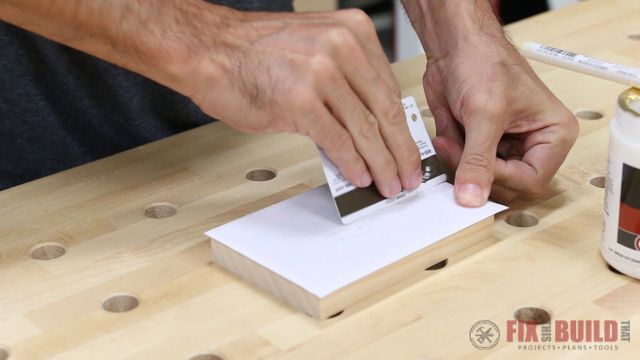 All you need for this process is some acetone (I’ve heard lacquer thinner also works), a paper towel, nitrile gloves to protect your hands and optionally you can use an old key card or credit card. 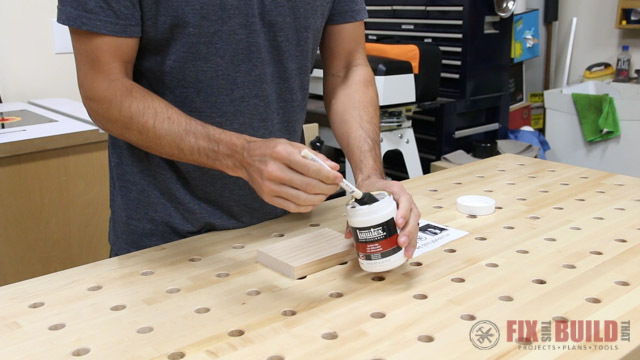 And be careful with the acetone and read and follow all the cautions on the can. I laid the mirror image print out on the wood and creased the paper over the edge to hold it in place. 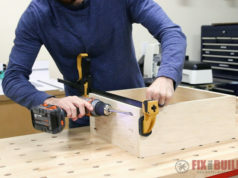 You could also use tape here. Then I used a plastic hotel key card wrapped in a shop towel dipped in the acetone to soak the paper and press firmly downward. After a few passes the toner is transferred to the wood. Then the paper peels right up with no stickyness and reveals the wood print with the image on it. 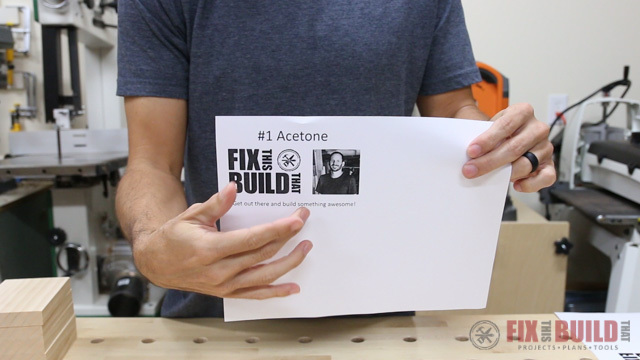 And here is what the acetone wood print looks like jut seconds after removing the paper. 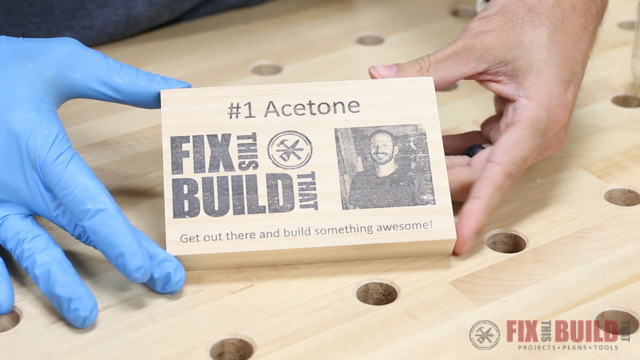 Printing on wood with acetone pro’s and con’s. 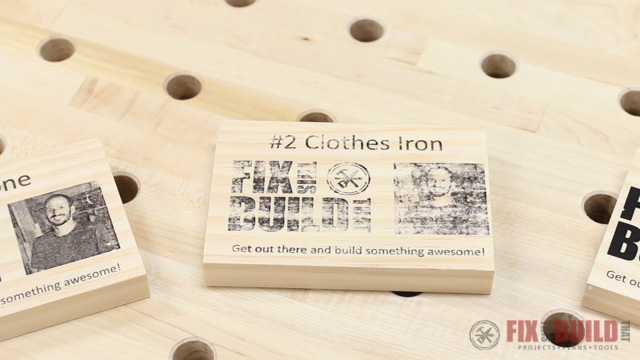 The next way to print on wood is using a simple clothes iron. 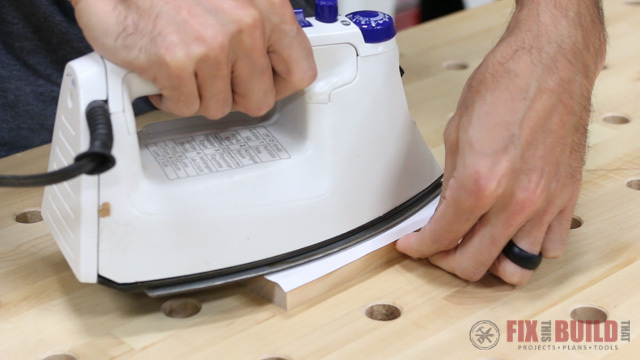 All you need is literally just the clothes iron here. I put the paper down like before creasing it over the edge. Then I literally just ironed the paper, making sure to keep it from moving around. I tried to press down hard and had the iron on high, but I still don’t think it was enough heat. When I peeled up the paper, the wood print did NOT look good. I think it was because this iron is pretty light duty and just didn’t get hot enough. 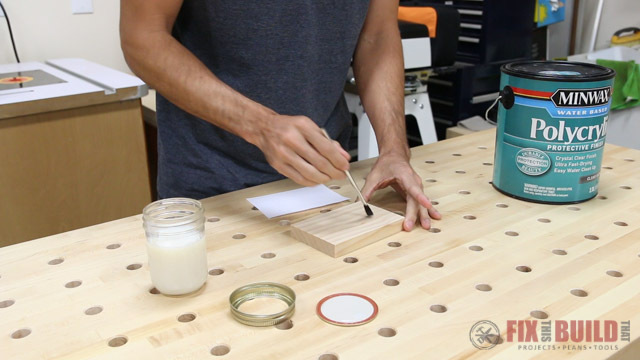 I’ve also since heard that printing on wax paper might make a difference or using a branding tip on a soldering iron. 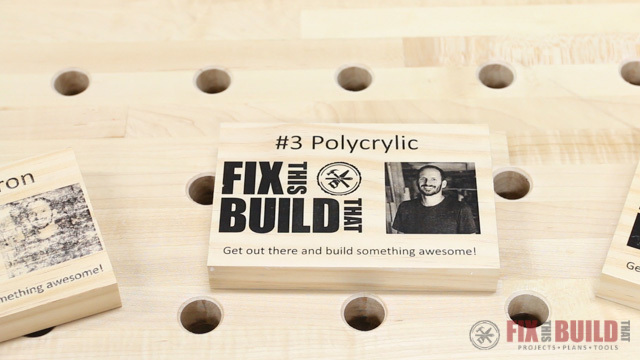 The third method to print on wood is using a water based polyurethane. 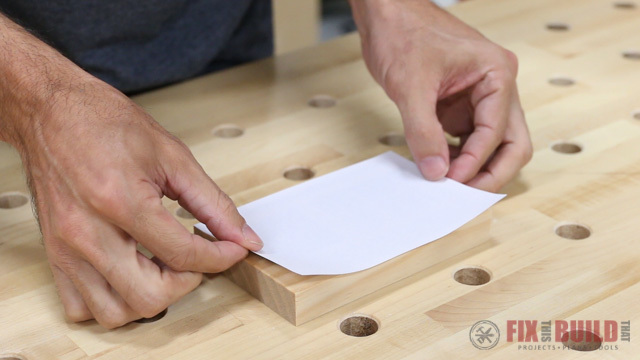 It’s a slightly different process as you stick the paper to the wood then remove it after it’s dry. 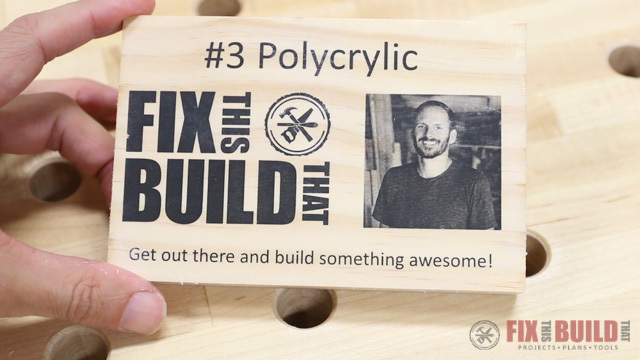 I’m using Polycrylic which is just a name brand poly. You’ll need the polycrylic, an acid brush (or other small brush), a stiff toothbrush and some water. I brushed on the polycrylic with a small acid brush trying to get a thin film that was wet but not puddling. I think less is better than more in this instance, and you don’t need a lot. 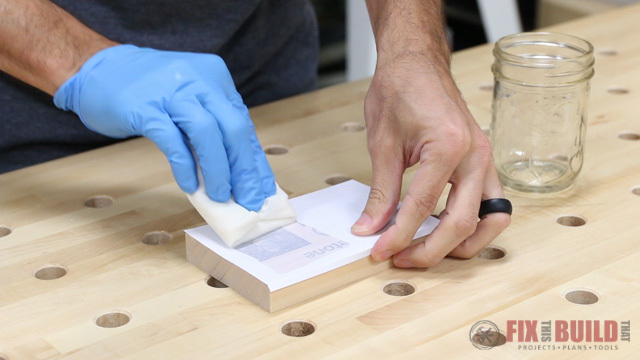 Then I pressed the paper down into the wet polycrylic and smoothed the paper from the center outward to remove any air bubbles and firmly seat the paper into the polycrylic before setting the wood print aside to dry for about an hour. 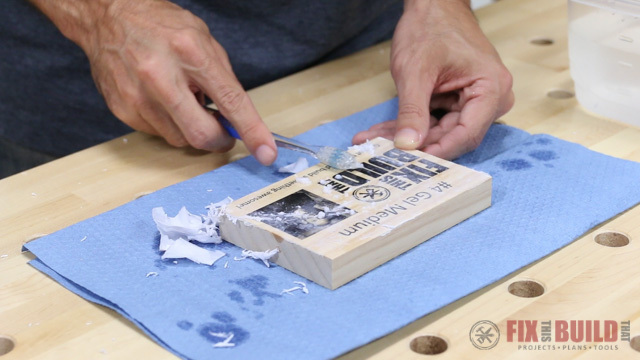 After the finish had dried, I found the easiest way to remove the paper from the wood print is to wet the whole back first then peel off as much as you can by hand before scrubbing. Then it’s just gentle scrubbing with the toothbrush until all the paper is gone. I wiped off the wood with a shop towel then looked at the wood print quality. Honestly this was the one that surprised me the most. The quality was excellent! Other than that little chip on the side of the “F” the wood print looked amazing. I was really pleased with this method of printing on wood. 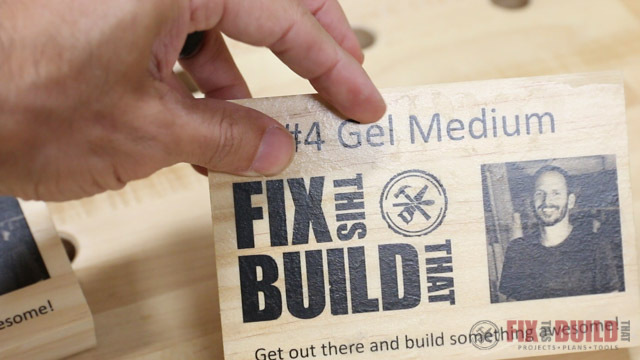 The fourth way to print on wood is to use a gel medium. I used Liquitex gloss, a foam brush, a key card, a tooth brush, and water for this method. 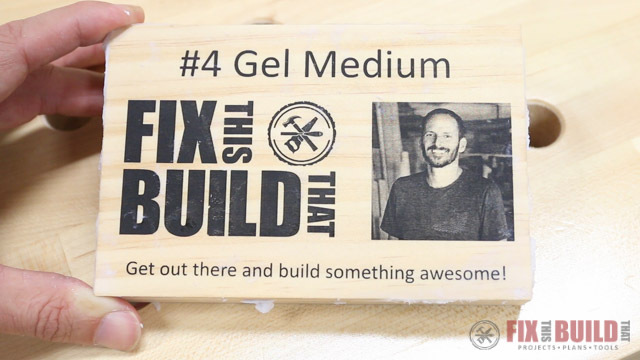 The gel medium goes on similarly to the polycrylic except it’s a gel vs a liquid. I found a foam brush worked well to distribute the gel because the brushes left too many ridges. Again, less is more here. I pressed the paper into the gel then pushed out the air bubbles with my fingers then the key card since the gel was a little thicker and not as easy to move as the polycrylic was. Then I set it aside to dry for about 90 minutes. The only thing different about scrubbing the gel medium is it seemed to grabbed much harder. I think this is because the gel is thicker and there is more build up on the surface. I think thinning the gel with water before application could help. After getting off most of the paper here is what the wood print looked like. There were a few spots that still had a little paper that I couldn’t get off on the first go. 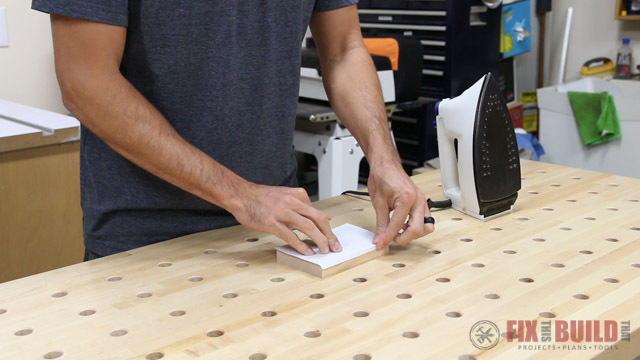 The next method to print on wood is definitely not DIY. 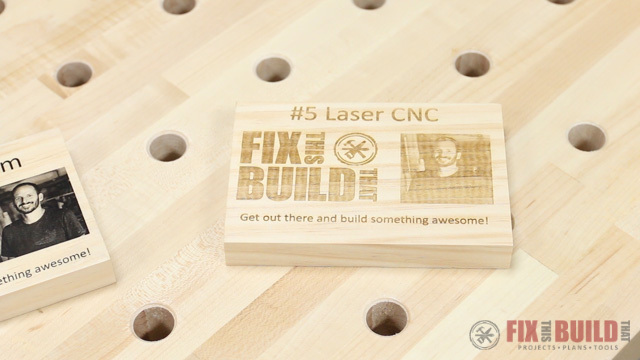 I used a Full Spectrum hobby laser that I got from Rockler Woodworking. 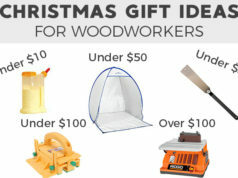 It can engrave wood, plastics and leather. The setup is pretty easy. 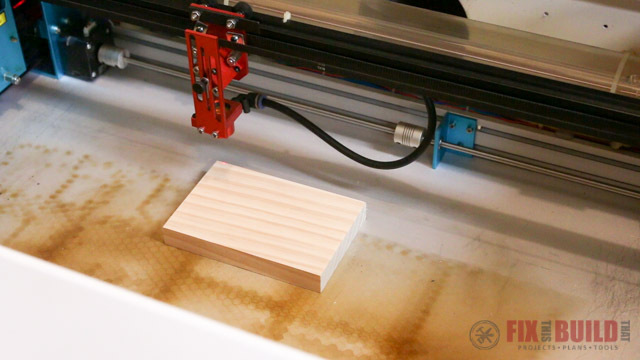 I put the wood in the machine, line up the positioning dot then press print similar to printing on paper. 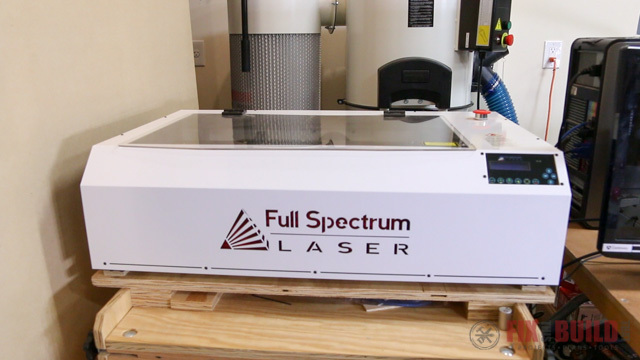 The laser starts it’s path and it isn’t fast but it’s fun to watch. And after about 8 minutes the print was done while I was cleaning up things in the shop. The wood print turned out really sharply defined as expected. 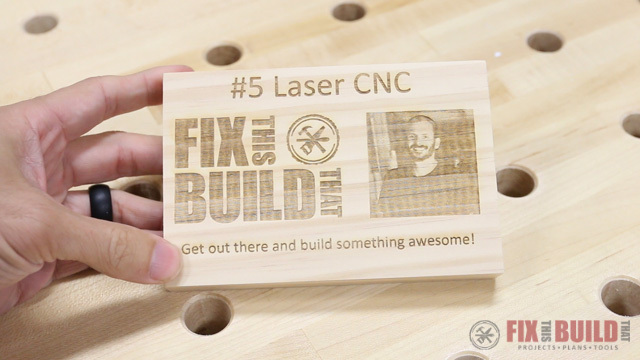 The only issue was with the image which a laser has a hard time replicating. But the text and logo design that are solid black looked great. After going through the five methods to print on wood I wanted to see how they reacted to a finish. I sprayed on two coats of spray lacquer and they actually changed quite a bit. The acetone wood print really darkened up with the lacquer applied. I liked this one a lot more after the finish and I’d put it ahead of the gel medium. The polycrilic wood print darkened up even more and still looks great. This is definitely my first choice. The gel medium wood print also darkened but the finish was not very smooth. The extra paper bits I didn’t get off really showed through. So to get it as smooth as the polycrylic I’d have to spend a lot more time cleaning. 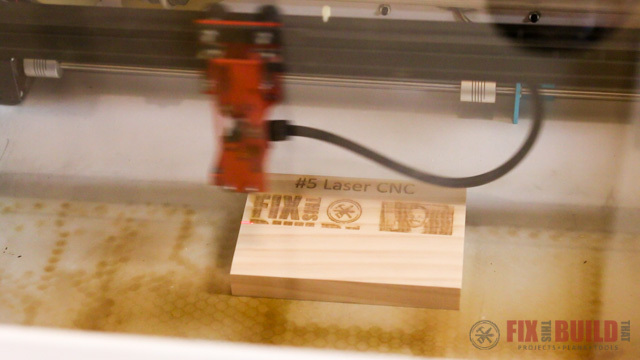 The CNC laser wood print didn’t really darken up. It’s more of a burnt wood look, but the detail is still great. 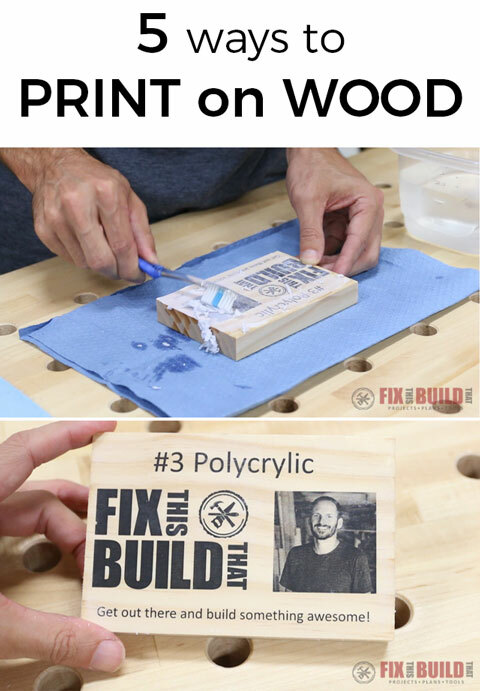 So there you go, 5 ways to print on wood. 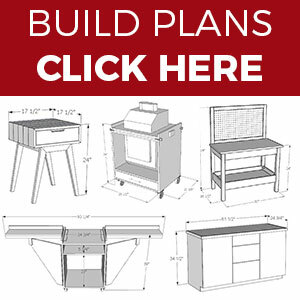 Hope you learned something new and if you want to check out some of my build projects you can find them on my Projects Page. 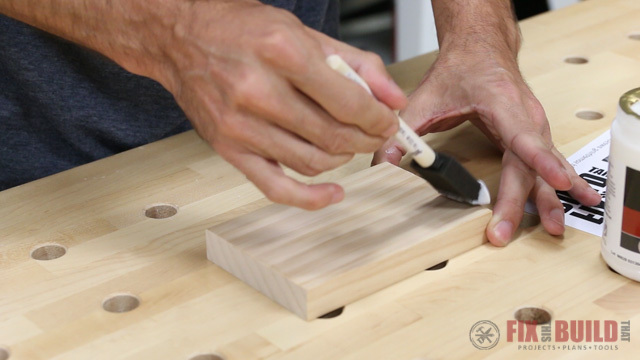 Rockler Woodworking and Hardware provided me with product and/or monetary compensation as a sponsor of this build. All opinions are my own and are not filtered by the sponsor.